DQ*Plus positively identifies and automatically merges duplicate records while preserving the most valuable data from each record. DQ*Plus positively identifies duplicate records (with certainty). This enables the automated merge of duplicate records. This is essential for any business that has a significant volume of data and it is key to maximizing the return on the investments you have made in enterprise applications. DQ*Plus automatically merges records in enterprise applications (Oracle E-Business Suite, Salesforce.com, Siebel) or will execute custom merge processes developed by you or with the help of the Acme Data team. DQ*Plus takes the final step and consolidates your duplicate records. Among a group of duplicate records, DQ*Plus finds the “Best Record” based on criteria that you define, and then selects the best field values among these duplicate records. 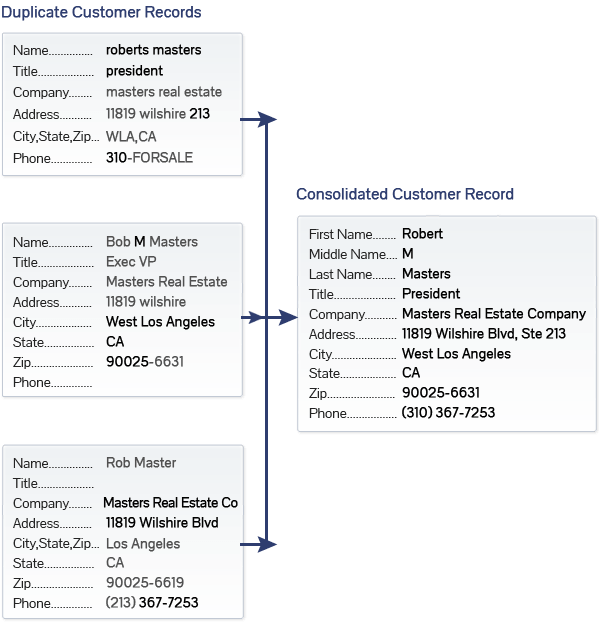 DQ*Plus merge processes consolidate duplicate records into one “Best Record” containing all of the desired values. To learn more about consolidating duplicate records using DQ*Plus call (925) 913-4593 or send email.